Dana Point Harbor: One of the most spectacular man-made harbors in the USA. The harbor and adjacent city are named after Richard Henry Dana, who, in 1835 at the age of 19, sailed around Cape Horn aboard the trading brig "Pilgrim" in search of cowhides for Boston shoe factories. Upon his return, he wrote the book "Two Years Before The Mast"
The harbor boasts 2 Marinas that host over 2,500 yachts, the Dana Point fishing fleets, fine and casual dining inside or on outdoor patios, many shops offering unique gifts, clothing and fresh seafood. 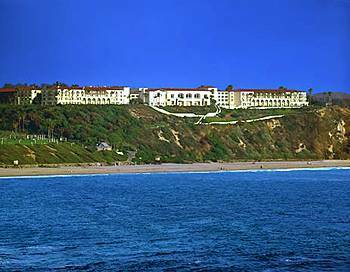 The Ritz-Carlton:This 'Ritzy' and elegant Hotel sits on the bluffs of Dana point boasts breath taking panoramic views of the Pacific Ocean and beach below. The hotel was designed to emphasize the beauty and serenity of the sea to the interior of the resort and guestrooms, while maintaining the grace and elegance of the property. Each room has beautifully hand-crafted and lighted glass art panels made in Europe that feature abstract images representative of the ocean, with three layers of blue, gray and silver. Every piece has been individually designed. The elegance of the glass panels was the inspiration for the guestroom design, bringing the peacefulness and subtlety of the ocean to each room. 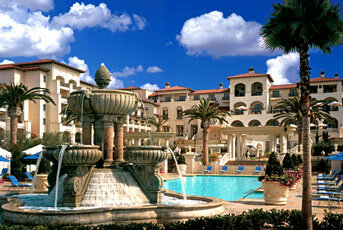 St. Regis Resort: Situated on 200 acres overlooking the Pacific Ocean stands Orange County's newest landmark. Few hotels in the world can match this extraordinary location. The St. Regis Resort, Monarch Beach Dana Point, built in Tuscan-style, is devoted to the pursuit of service and elegance with a seamless blend of comfort and technology. Most of the spacious, elegantly appointed guestrooms command spectacular views of the Pacific Ocean and the dining experience ranges from intimate indoor venues to dramatic ocean view garden settings. 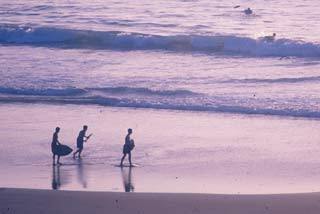 Salt Creek Beach: This beautiful beach front Park Provides South County residents access to 18 acres of public beaches. 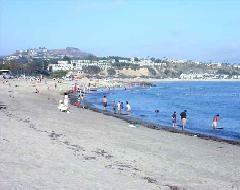 The park consists of landscaped parking facility, sandy beaches, rocky promontories, and sheer cliffs. The original ravine canyon locally known as Salt Creek, makes the northerly boundary of the beach. Grading and landscaping have been completed in such a manner as to blend with the natural features, leaving the beach and cliff area basically undisturbed.